Your Stupid Minds: What are they teaching our kids these days? What are they teaching our kids these days? Via Adam Pecht. From a psychology textbook. 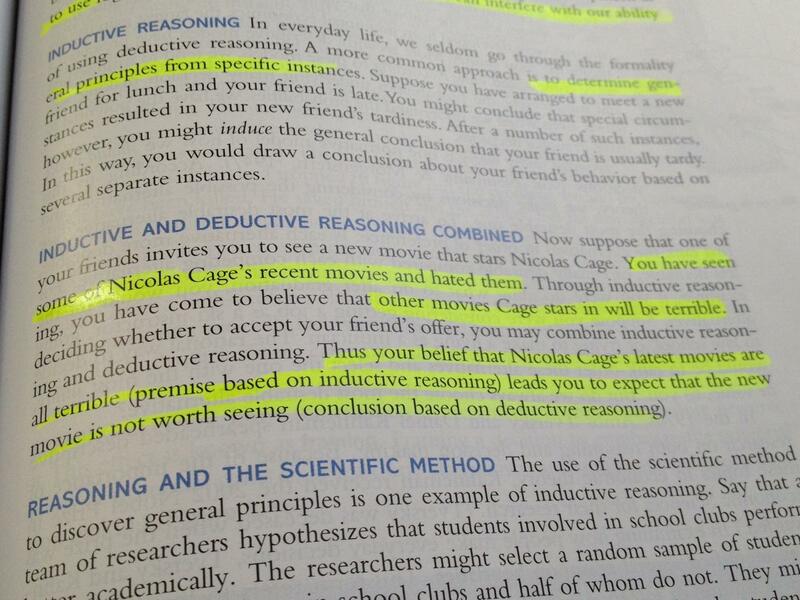 INDUCTIVE AND DEDUCTIVE REASONING COMBINED Now suppose that one of your friends invites you to see a new movie that stars Nicolas Cage. You have seen some of Nicolas Cage's recent movies and hated them. Through inductive reasoning, you have come to believe that other movies Cage stars in will be terrible. In deciding whether to accept your friend's offer, you may combine inductive reasoning and deductive reasoning. Thus your belief that Nicolas Cage's latest movies are all terrible (premise based on inductive reasoning) leads you to expect that the new movie is not worth seeing (conclusion based on deductive reasoning). INDUCTIVE AND DEDUCTIVE REASONING COMBINED Now suppose that one of your friends invites you to see a new movie that stars Nicolas Cage. You have seen some of Nicolas Cage's films and hated them. Through inductive reasoning you can conclude that you are not fun and have terrible taste, and an actor's entire oeuvre cannot be deduced through one passive viewing of The Weather Man on an airplane. You immediately rent Face/Off and Vampire's Kiss and deduce that Nicolas Cage's movies are always worth watching regardless of quality or content, because Cage is literally insane. You then accept your friend's offer and it is awesome. Hahaha. I hope they correct this in the second edition.